I love summer meals. Cool, refreshing, and nonchalant; celebrating the spontaneous combination of any variety of flavors without a clash because everything is fresh, fresh, fresh. 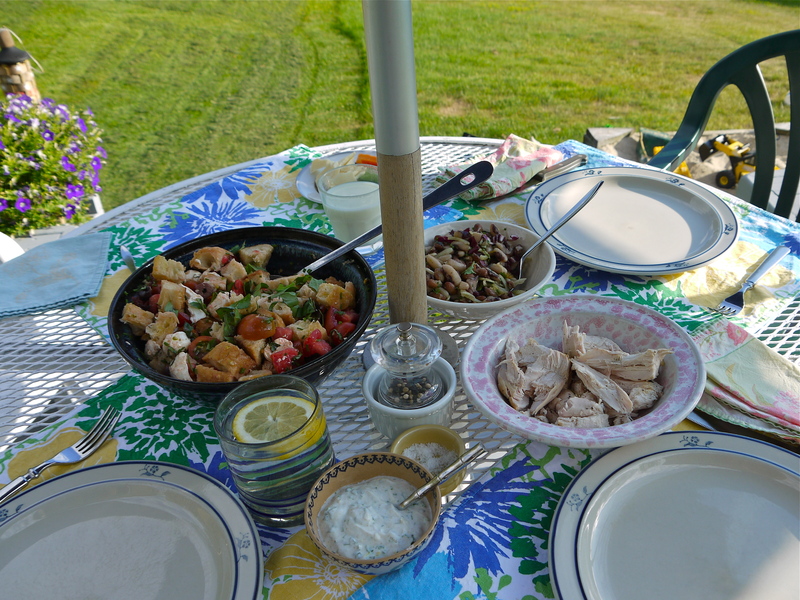 Tonight in Vermont, I threw together a meal every ingredient of which was local, (with the allowable exceptions of a lemon, an orange, Kalamata olives, some Spanish olive oil, salt and pepper, and a pinch each of cumin and coriander–Mediterranean items that don’t grow in these here parts). > a cold bean salad with two varieties of heirloom beans grown by Killdeer Farm, here in Norwich, fennel, orange segments, radicchio, olive oil, and herbs from my mom’s herb garden. > panzanella: tomatoes, a stale baguette, fresh mozzarella, garlic, chives, olives, backyard basil. > corn on the cob, picked this morning and as sweet as dessert. > grilled heirloom eggplant, summer squash, and zucchini from the neighbors’ garden. > a Lebanese-style yogurt sauce for the grilled veggies and chicken. The best supporting actor award in this meal goes to the yogurt sauce, which I hadn’t made before, but which will now be my default leftover-chicken-jazzer-up. Stir it all up and adjust the seasonings to taste.